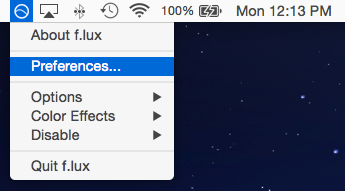 Switching between Chrome and other programs makes Flux turn off and on? I am having the same issue on a 2013 MBP 13" retina running El Capitan. Thanks lorna it was disabled but I was actually having that problem with the mail app and I just checked and I had f.lux disabled for that app how I don't know because I don't recall doing it. I followed your instructions in your post and now it is fixed thank you. @lorna Intense blue artifacts in full screen youtube and netflix still occurring. Any fix for that yet? Best I got is use Chrome for now. Some reports are that it's improved with the newest versions of OS and browser.